Our kennel has selectively bred pups of excellent type and character. With experience of over twenty five years and an ongoing breeding program, we can offer you a quality puppy. We have imported Four males to improve the bloodlines here in Australia and can offer the most current bloodlines from Germany via our males, As Du Domaine Du Val D'Aulnoy, who is a stunnig son of Zamp Von Thermodos and we announce with great excitnment the arrival of Gerry Von Schacher. 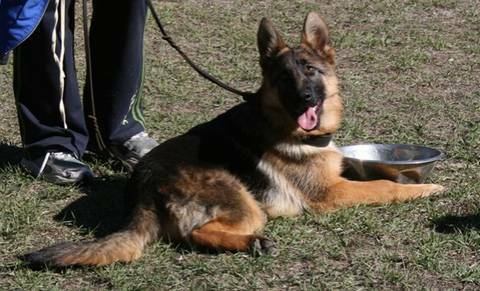 We also await the arrival of Java Von Sanatamar who will further strengthen our small kennel. We x-ray all our stock and support all the relevant breed schemes. We offer ongoing support whether you are purchasing a puppy for a loving family pet, a show or obedience dog and we many representatives in all facets of the breed. We take great pride in both our kennels and our breeding practises and encourage your visitation.